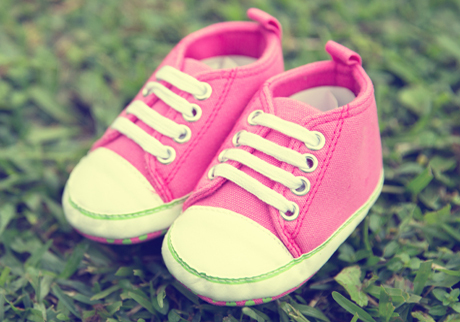 Let’s face it, baby shoes are darn cute. But beyond the eye appeal, there are conflicting opinions about whether baby feet should be shod. We asked Denis Leduc, chair of the community paediatrics committee of the Canadian Paediatric Society (CPS), to lay to rest the most common myths. 1. Babies need shoes to ensure proper foot development. Not true, says Leduc. “A shoe does not shape the foot better — in fact, there is a body of evidence that the development of the arch is encouraged better by walking barefoot.” The CPS statement on infant shoes says walking barefoot develops good toe gripping and muscular strength. However, sometimes a baby’s foot, or walking gait, looks odd to parents. “Sometimes the intrauterine position will have an effect in the first months,” Leduc explains. “The legs may be bowed or the feet may be turned in. Usually this will just go away. And babies will sometimes stand with their feet turned in, or turned out like Charlie Chaplin, but this is related to how the hips are placed for stability, not the feet. The foot just sort of goes along with the rest of the leg.” In rare cases where there is a problem that requires treatment, “it might involve physiotherapy or casts, followed by a special orthopaedic shoe,” he says. 2. Babies need shoes for ankle or arch support. According to Leduc, there’s no evidence that babies need support when walking. “A shoe doesn’t improve ankle strength,” he says, “on the contrary.” As for arch supports, these may be necessary for an older child or adult, but babies don’t need them. You might even say they have their own built-in arch support. “A baby’s foot has a fat pad underneath it that makes it look like there is no arch,” explains Leduc. “But the foot isn’t really flat — the fat pad is just concealing the arch.” So a really prominent arch support may not even fit the shape of the baby’s foot. “A soft shoe is fine,” says Leduc. “It doesn’t have to be a rigid shoe. A baby is out of shoes in three to six months and you could end up spending a lot of money.” Of course, you’ll have individual preferences. If your baby tends to get hot, sweaty feet, for example, you may want to avoid vinyl shoes, which don’t breathe as well as leather, nylon or canvas. And while ankle boots have no great advantage medically, they are harder for babies to remove. Whatever the price, a shoe that fits well is important. The CPS advises that shoes must fit properly at the heel (no slipping and sliding), and that new shoes should leave about 1.25 cm (about half an inch) between the longest toe and the tip of the shoe when the child is standing. 3. Barefoot is always better. Not necessarily. Shoes provide protection, warmth and grip on a slippery surface. “A shoe is to protect a little foot from being bumped, scraped or injured,” says Leduc. “That’s all.” Or not quite all. Shoes work better than anything for keeping little socks on. And sometimes… well sometimes, you have to indulge yourself and add a pair of shoes to the outfit — just because they are so darn cute.